Julien Taramarcaz was the revelation of Roubaix. Photo: Balint. After podium last weekend in Sterling, Shawn Milne battled New England’s best in Warwick, Rhode Island, picking up a pair of UCI C2 wins. 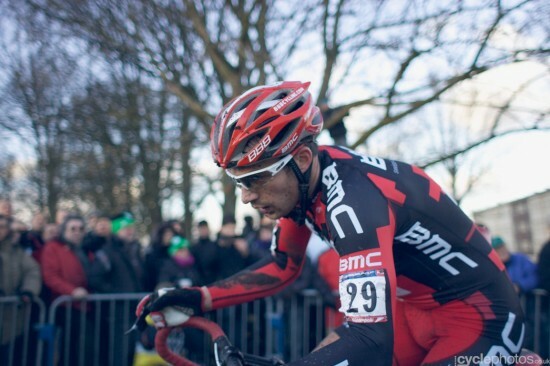 Milne has been around for a while, but these two wins have marked his arrival in elite cross. In LA, Tim Johnson (who in my defense was not on the start list) and Jamie Driscoll picked up wins, while Ben Berden won the Cross After Dark overall. As usual, Sven Nys kept everyone on the edge of their seats in Roubaix where he would win the fourth round of the World Cup. Nys took his time to get to the front before smashing Niels Albert and Kevin Pauwels into the ground during the final lap. This entry was posted in Races and tagged ben berden, cross after dark, cxla, Cyclocross, jamie driscoll, kevin pauwels, nepcx, niels albert, shawn milne, sven nys, world cup. Bookmark the permalink.